ORIGINALLY PRICED AT $1,998. PLEASE CONTACT BRAVURA FOR SALE PRICE. Discontinued. Steal the spotlight with this glamorous sheath featuring layers of feminine lace. Kyle also offers a flattering sweetheart neckline and lace tapered shoulder straps with a dramatic keyhole back. 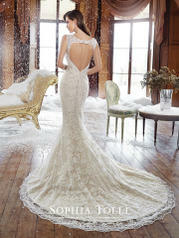 A back zipper trimmed with diamante buttons and chapel length train complete this divine gown.